Let’s say you’re going to teach a class about love from the Bible. You can choose only five texts or verses. What five will you choose? Why these five? But say this was you speaking to Corinth. Say this was you striving to be the example. What would be the three “top things” that you would hope the Corinthians would see in your life that could be attributed to a major characteristic of the life that Jesus lived? Share your thoughts! I’m interested in hearing what you have to say. Here are some random questions (some may even call them “nudges”) that actually have a spiritual starting point. Care to answer a few? 1. If you preach, do you have a “favorite” sermon? 2. If you don’t preach, is there a sermon that has stuck with you through the years? 3. Would you consider an “invitation song” offered during worship services a tradition of men? 4. What do you believe is the number one reason (main contributing factor) behind poor worship service attendance? 5. If you have a young daughter, would you approve of her dating a young man who doesn’t work? 6. How many hours of sleep do you average a night (or day, in case you’re a third-shifter)? 7. How many hours, on the average, do you punch on the ole’ time clock? 8. Was there one individual person in your life that contributed the most to you becoming a Christian? If so, who? 9. What you do think is the number thing our prayers should revolve around for our nation (America), or for whatever nation you happen to be living in? 10. Which is harder for you to do: tell a brother or sister in Christ that they have something in their teeth or telling them that they have sinned against you? There are some in the brotherhood who are staunchly opposed to talking about the birth of Christ at this time of the year in scripture, in song or even conversation because they claim it’s denominational, but at the same time they staunchly promote using the word Christmas when it comes to trees, cards and presents. You tell me, which is more denominational? Talking about the birth of Christ or saying Merry Christmas? Nudge: Bully Pulpit or Something Else? I don’t know if you have seen this video, but take a look and come back and leave a comment describing your thoughts with 50 words or less…if you can keep it to that. I thought it might get some interesting dialogue going. God’s grace is truly dynamic! What do you think? It is one or the other, or is it both? Think about it and chip in. I have my answer, but I’d love to hear yours! 1) There’s a good reason to get wrapped up in the story we read about Jesus. That’s because He cares. We have a mediator who feels for us because He felt for us (Hebrews 4:15-16). 2) We need to be willing to speak up and go on the record for Jesus. If John was willing to speak up for the coming Messiah then we should be willing to speak up for the Messiah who has come (Matthew 10:32-33). 3) If we want God’s will to open up for us then we need to open up His word. Faith in Jesus is found only in the word of God (Romans 10:17) and if we want to learn about the will of God for our lives when it comes to the Lamb of God then we need to open the word that teaches us all about it. I’m trying to figure out a way to post this sermon’s (and last week’s) audio to the website. I can get the audio file off of my phone and onto my computer, but from there it’s a little more tricky for me. I’m no techie but I’m trying. Nudge: What Do You Know About The “Tech”nical Gospel? Does anyone know of any good, free Bible related apps? Also, do you know of any apps (and things like podcasts) that are put out by the brotherhood? If you have found one (or several) to be particularly useful in your studies, share what you know. Nudge: Why Does God Encourage Children to be in Subjection to their Parents? It’s not really open for debate – from the 10 Commandments of Moses’s Law, to the 6th Chapter of Ephesians, to the scathing rebuke of the scribes and Pharisees concerning the personal care (or the lack thereof) for their parents and ultimately God in Mark 7, God says children must take note of their parents when it comes to writing the chapters of their life story. So here’s the nudge: Why is this such an important issue to God, and what about honoring parents who do not care for God or for His way of life? I’d love to hear your answers, especially to the later part since so many young people (including Christians) deal with this family situation in our culture today. Nudge…What Song Would Jonah Have Sung? I didn’t ask (maybe I should have), but I don’t think Randal will mind if I use a “nudge” to try and get some conversation going this morning. It’s been a long while since I’ve seen one anyways. So here you go. Let me know what you think. One of the amazing things to me about some of God’s people recorded in the Bible was their ability to sing in hard or even perilous times. Take Paul and Silas for the easiest example. Shackled in a stinking prison with open wounds on their body – and they’re singing at midnight…loud enough for other prisoners to hear them. Wow! What say ye when it comes to what sang he? 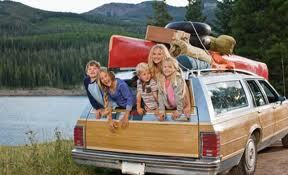 Answer if you dare: List your must-haves for a successful road trip, especially if it’s unusual. Why do you consider it essential? With the hassle of air travel, perhaps the road trip is experiencing a revival, would you say? Unless fuel prices are keeping people home. Thanks to plinky for today’s Nudge question. Plinky suggested this Nudge today: Confess a wasteful habit of yours. Doesn’t matter what’s being wasted, be it time, paper, gas, room heat, you name it. What do you do exactly that causes something to be wasted? If confession is good for the soul, who knows but it may also be good for the budget and the environment? If you could be an editor for any magazine, which would you choose? It can be print or ezine, religious or other. Be sure to tell us why you chose as you did. I love to laugh & enjoy good humor! Occasionally, I mistakenly take it too far (with folks who don’t share the same liberal sense of humor).